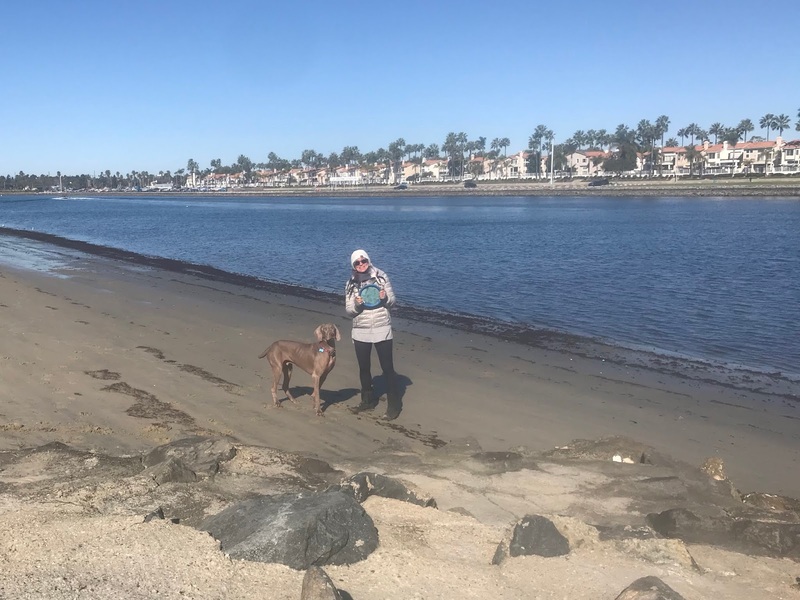 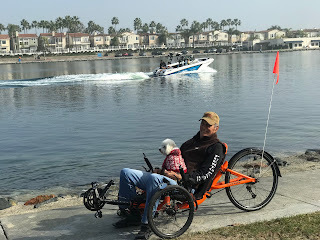 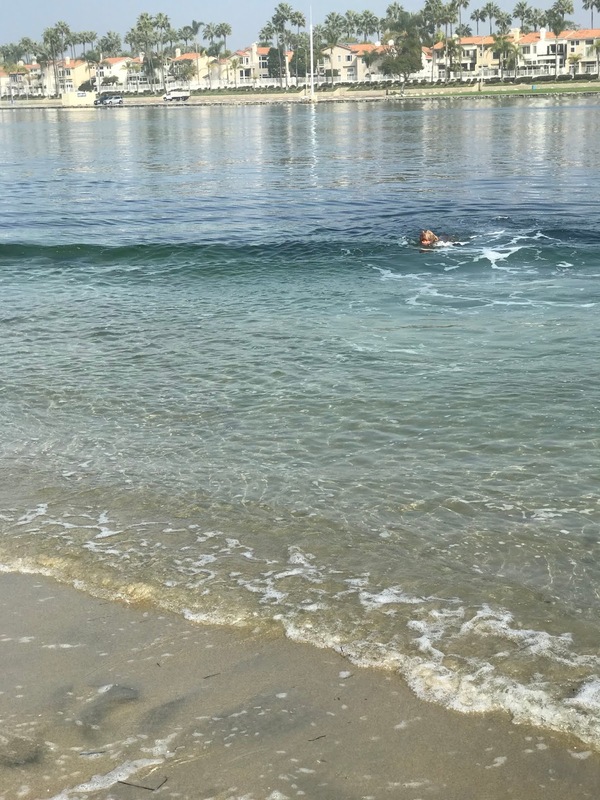 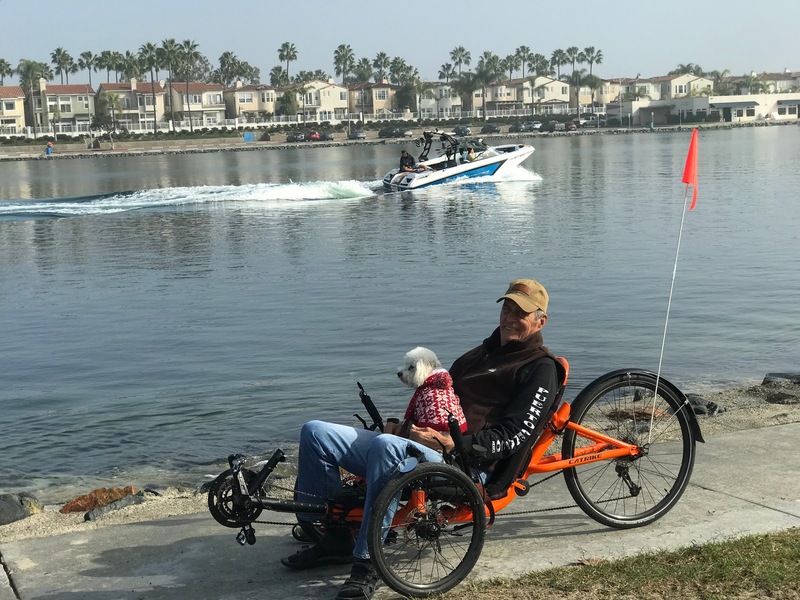 I am blessed and very grateful to live in Long Beach, California and within walking distance to the ocean and various inland waterways and bays that make my city a paradise. 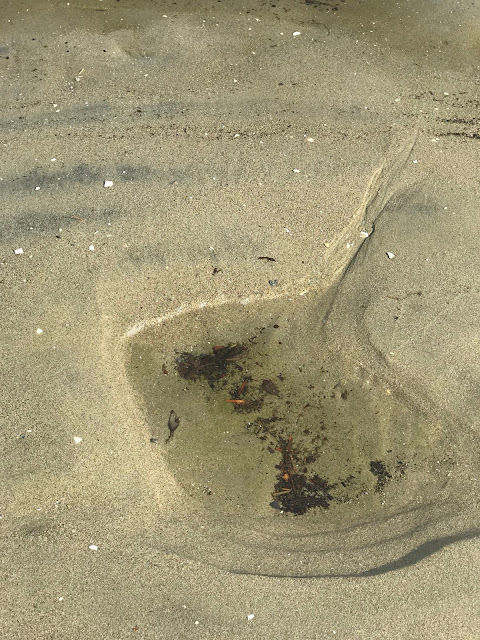 There is sand and grass and bluffs and sometimes mud and muck with beautiful birds and jumping fish. 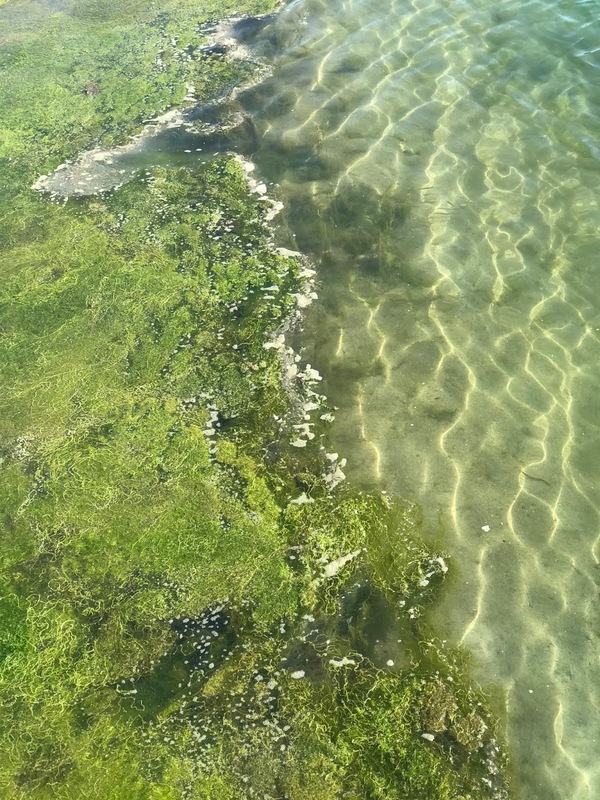 There are blue waters and green waters and oftentimes brown waters. 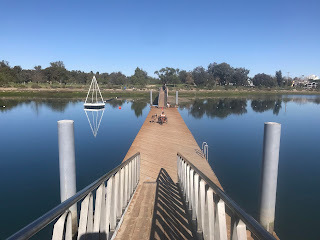 It's clear, it's calm, it's a high tide cresting over the life guide chairs or a low tide making it harder to climb up the bridge to cross the lagoon. 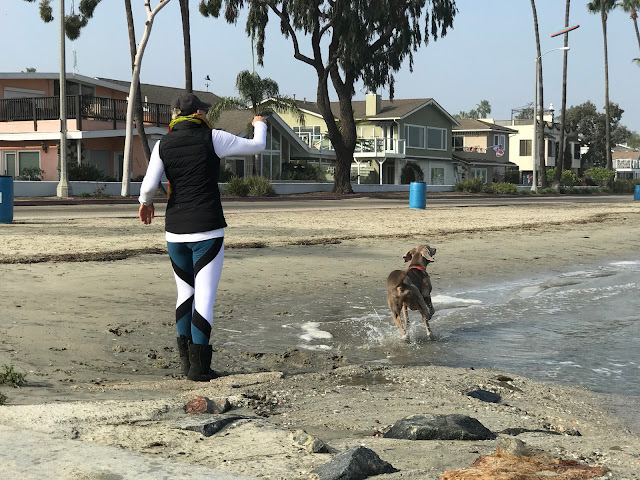 I never tire of walking or riding my bike to the beach and playing endless frisbee with my athletic dog Kiza. 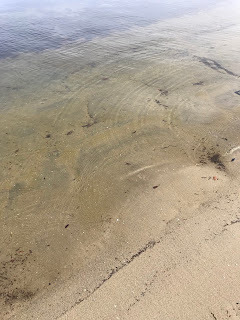 The beach and the ocean offer solace, sun, activity, reflection and so much more. 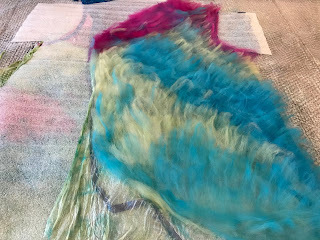 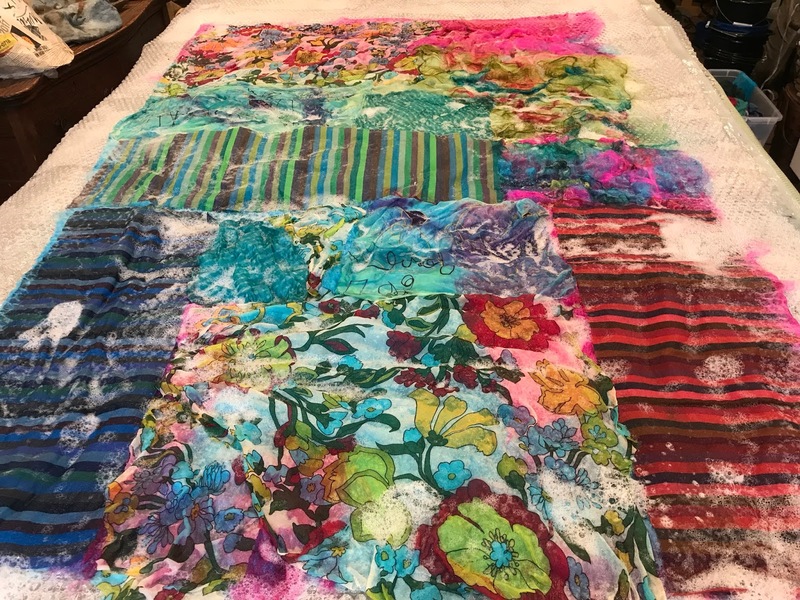 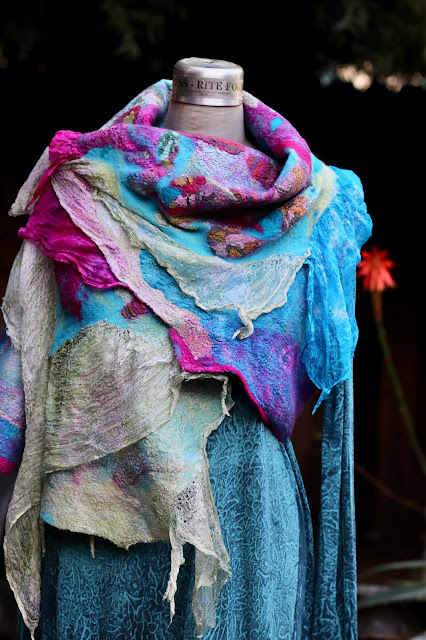 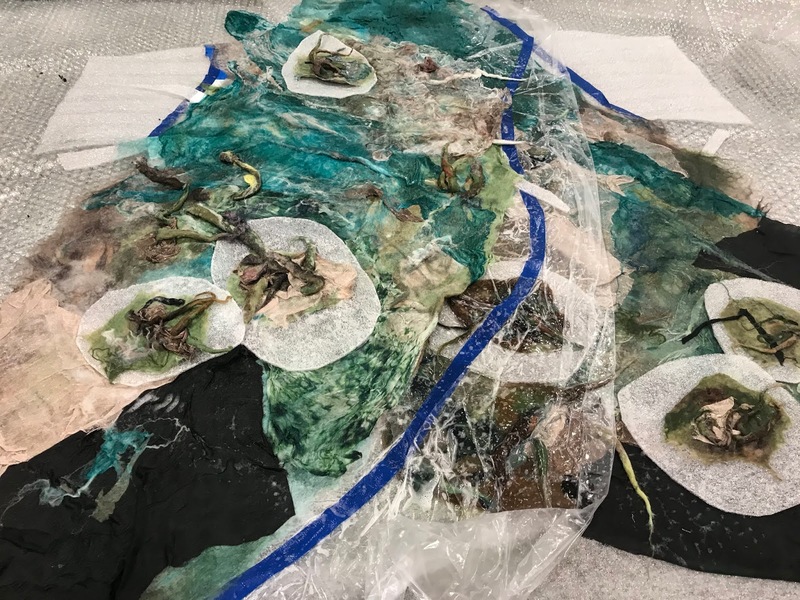 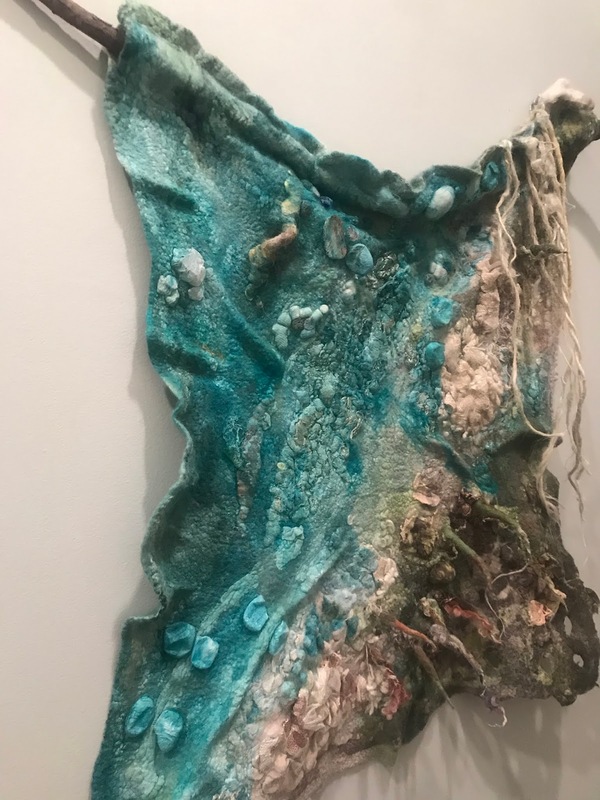 I was inspired by my routine visits to the beach, the bay and the inland waterways to create a nuno felted poncho reflecting my vision of a compilation of of these scenes. 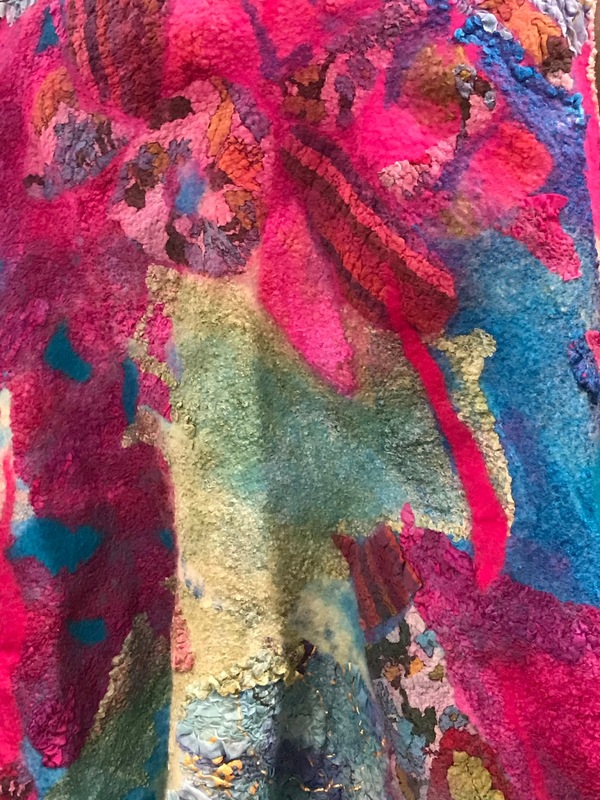 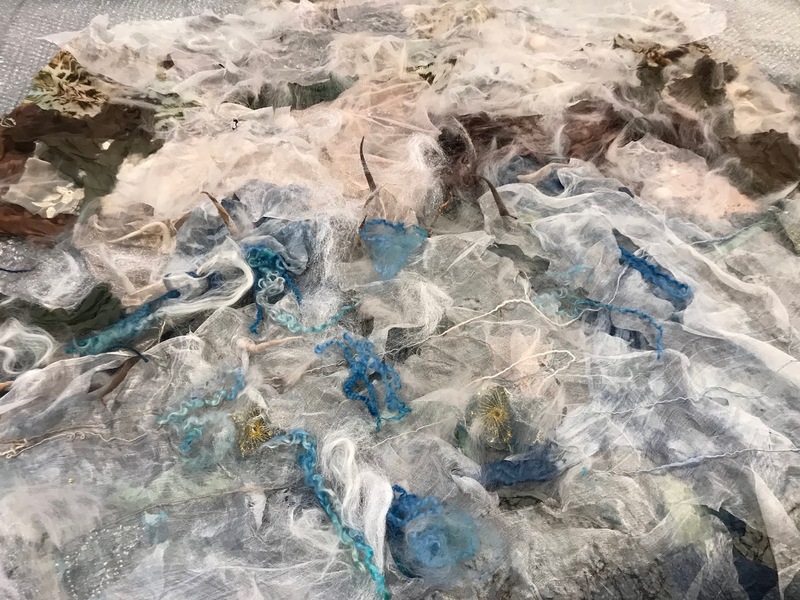 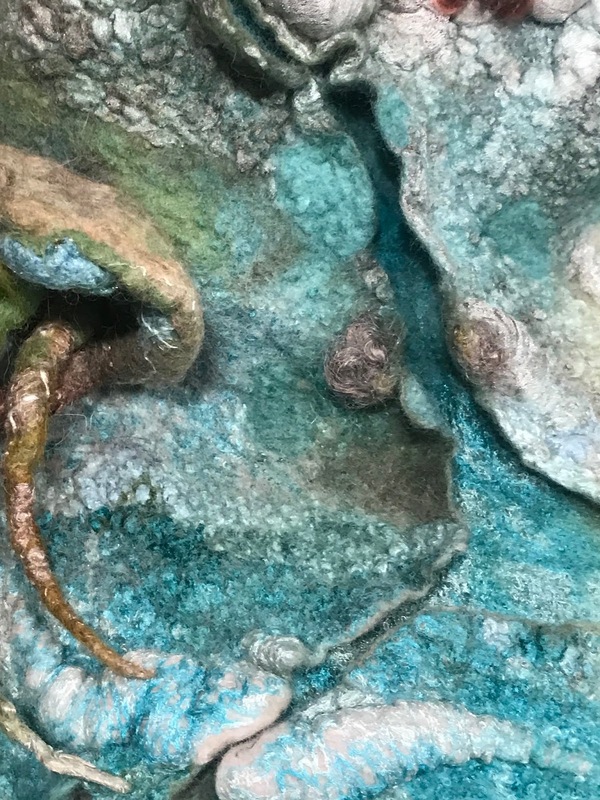 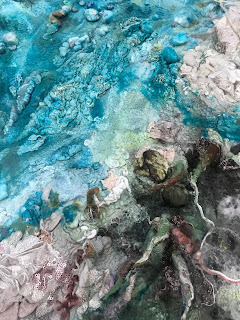 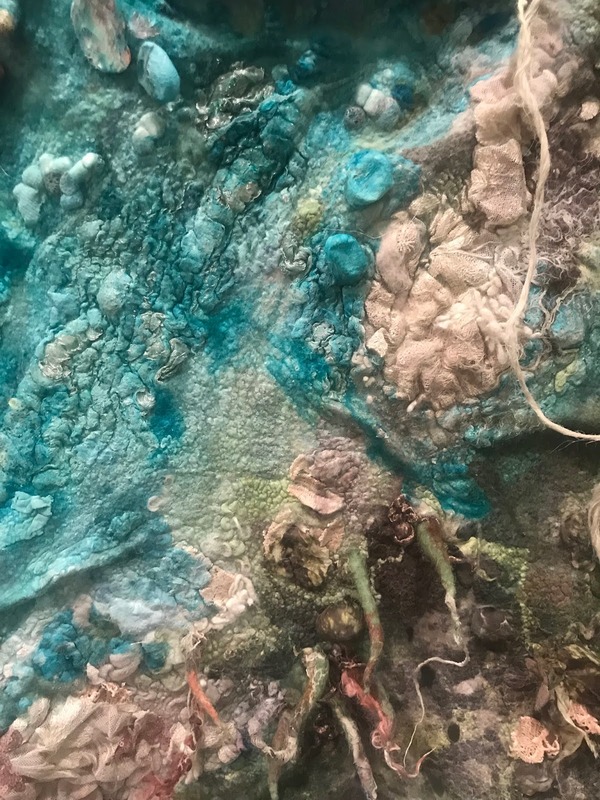 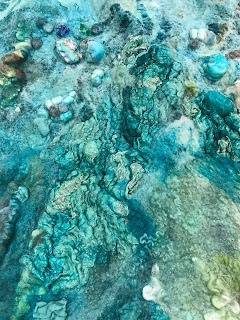 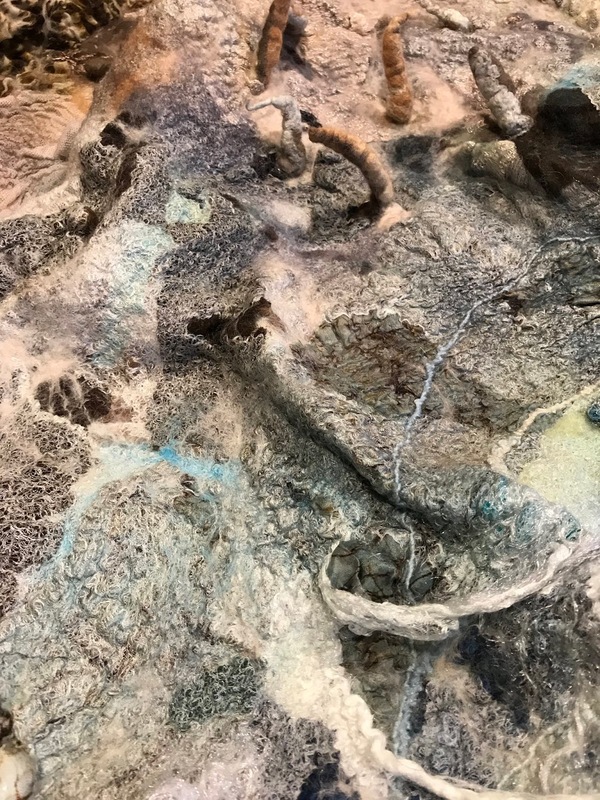 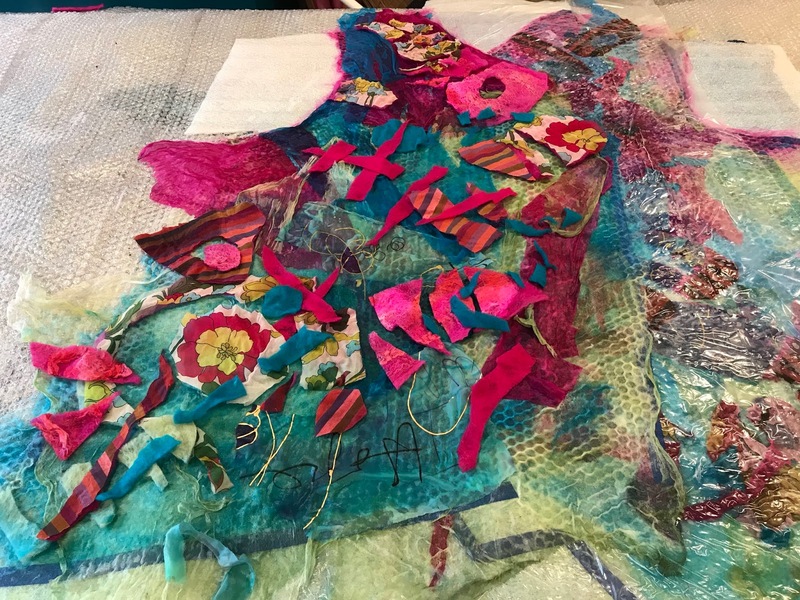 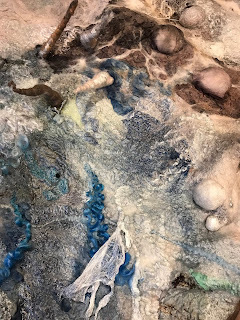 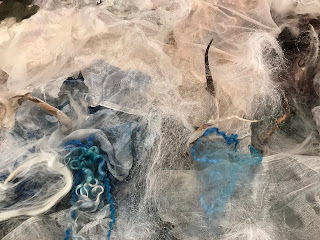 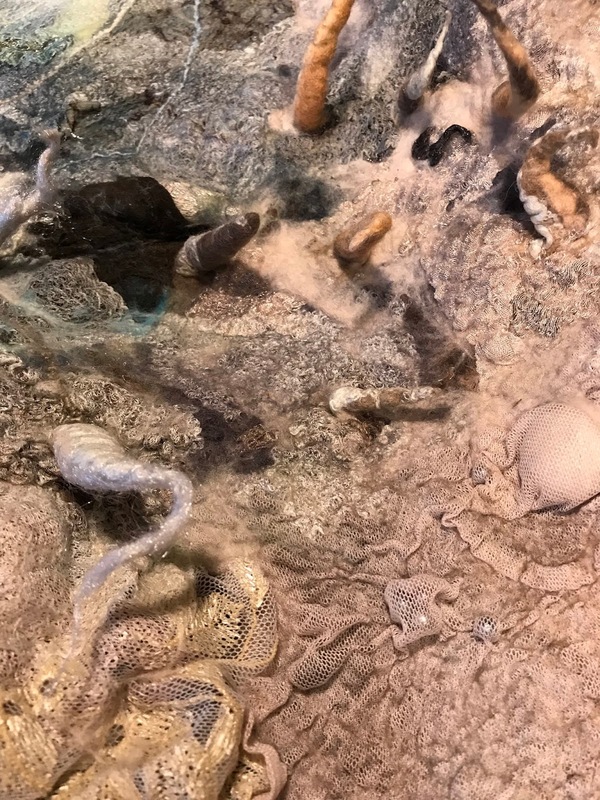 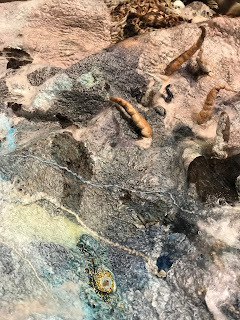 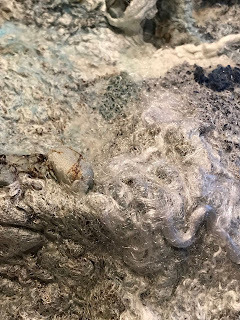 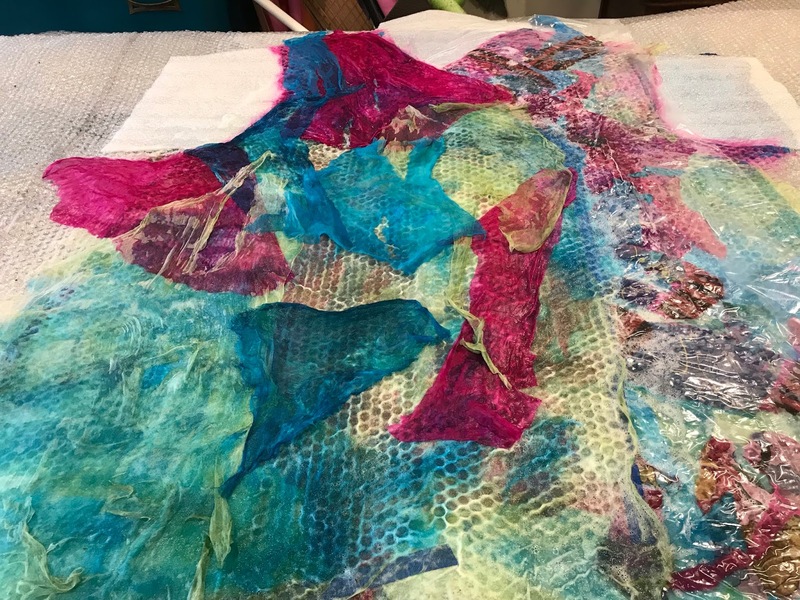 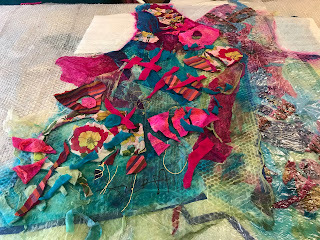 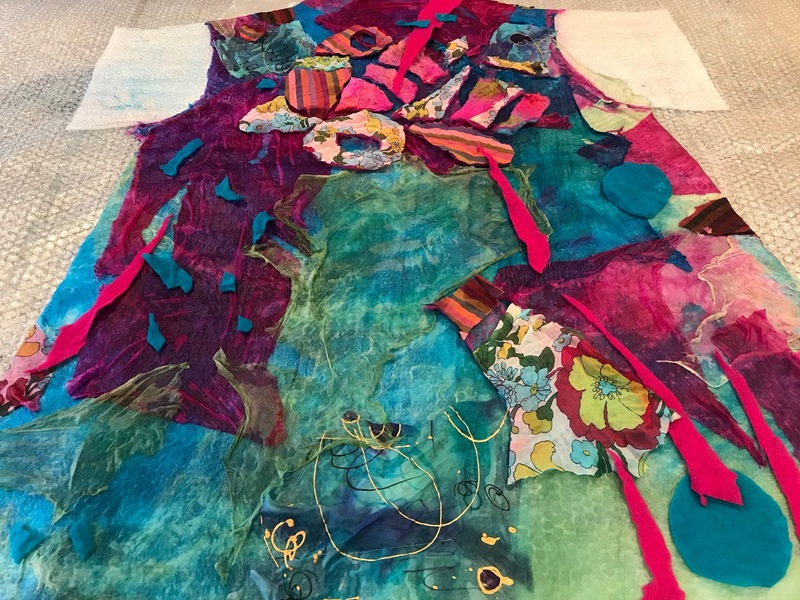 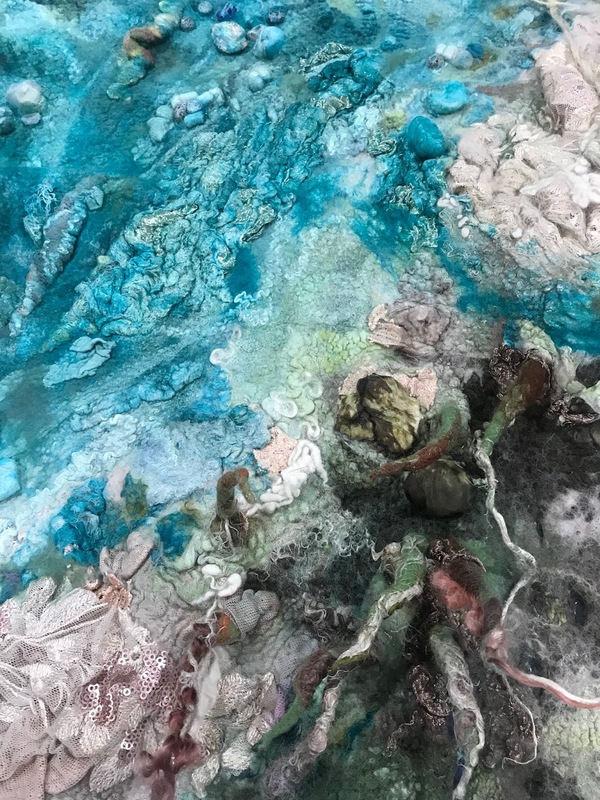 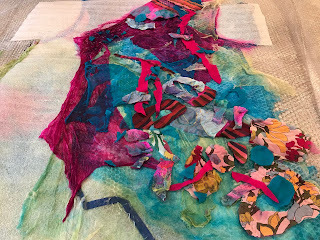 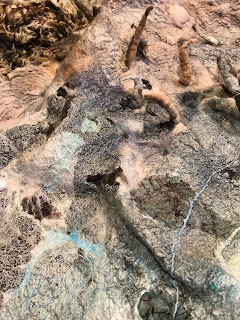 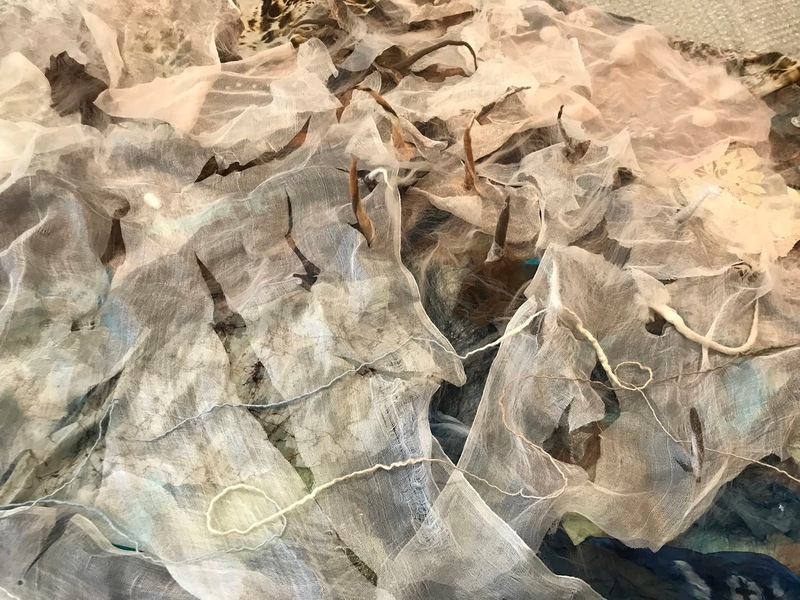 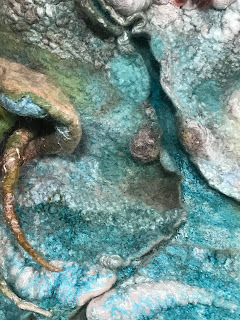 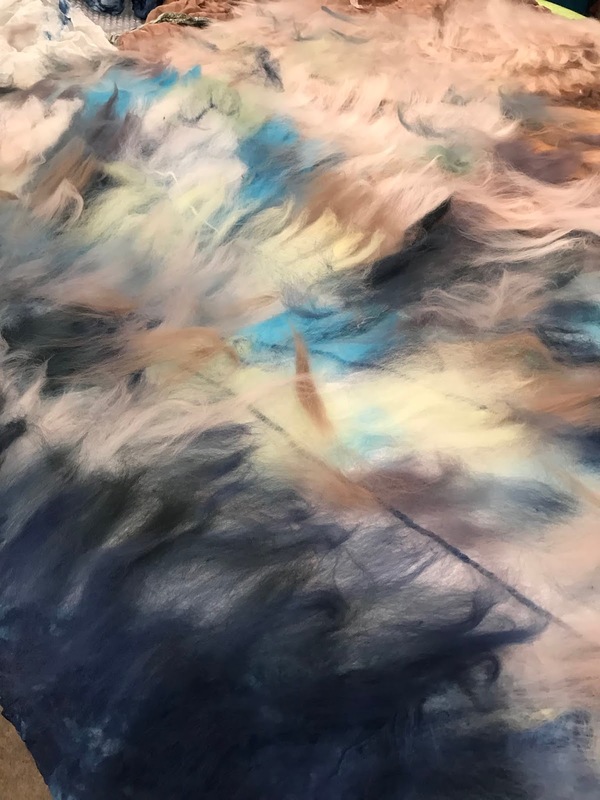 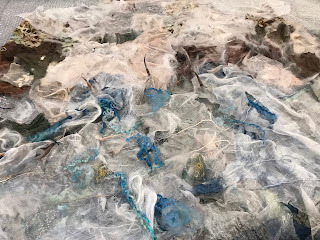 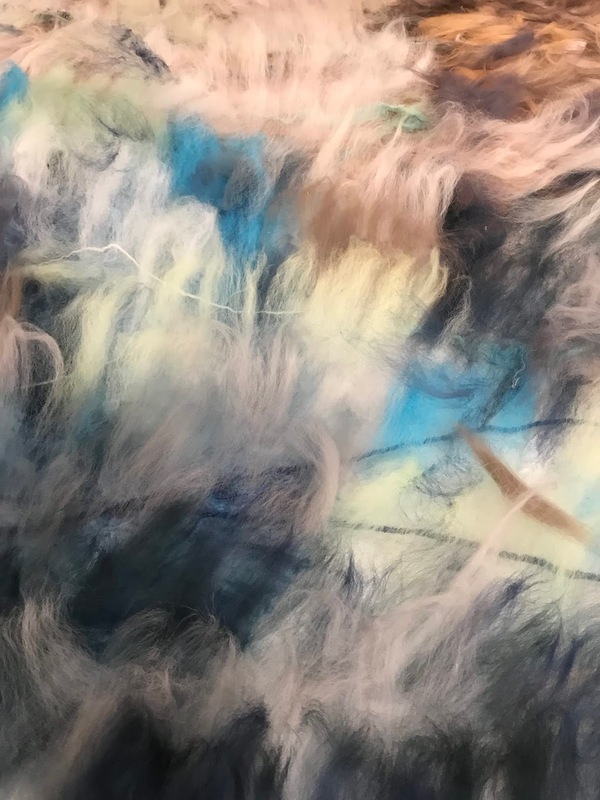 I wanted to create the texture I feel and see at the beach so I layered the piece with wool roving, silk and upcycled fabrics, yarn, beads, threads, felted balls and cords to create a texture of the beach from the sand to the water and the two ebbing and flowing into each other. 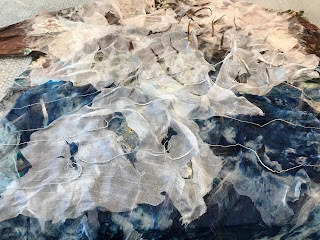 I put some plastic under some of the Margilan silk to create the feel of whitecaps and seaform. 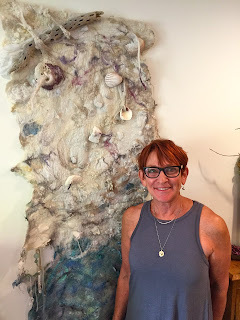 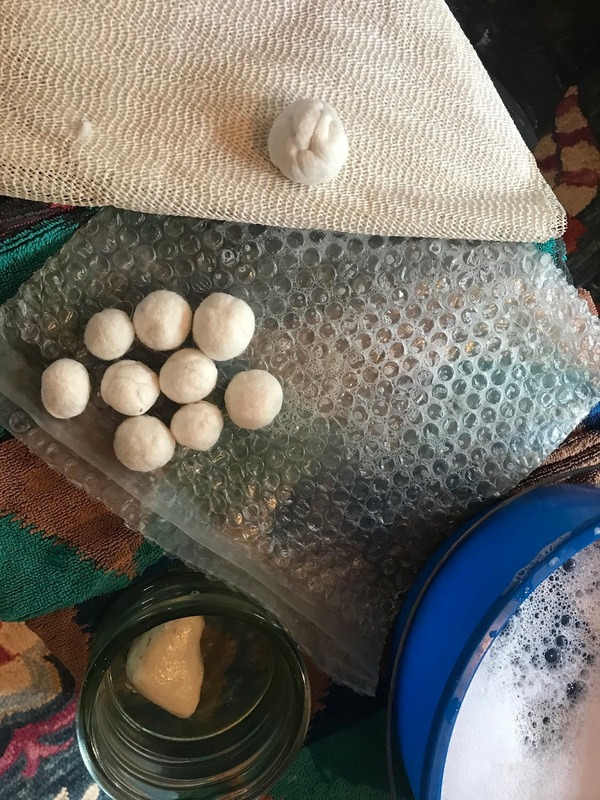 I cut the felted balls in half and placed them under some silk to create the feel of silt, sand loam and shells. 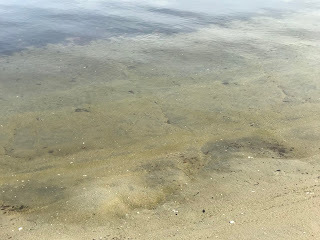 The cords reflect reeds and growth along the silty areas of the inland waterways. 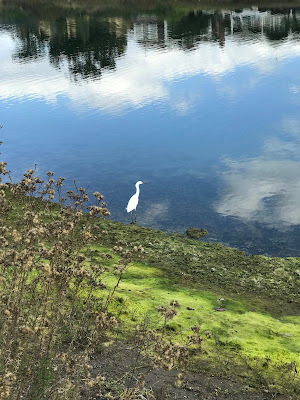 The Colorado Lagoon in Long Beach, California is an amazing urban wetlands and a place I frequent either on foot or by bike several times a week. I am lucky to live near this wonderful habitat which is less than a mile from home. It is a place to swim, sun bathe, bird watch, learn about natural habitat, reflect, walk dogs and more. 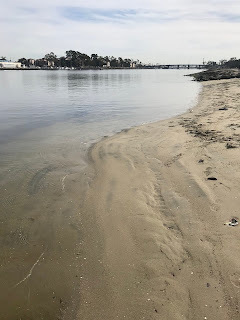 When I first moved to Long Beach over 45 years ago, this place was referred to as the polio pit. 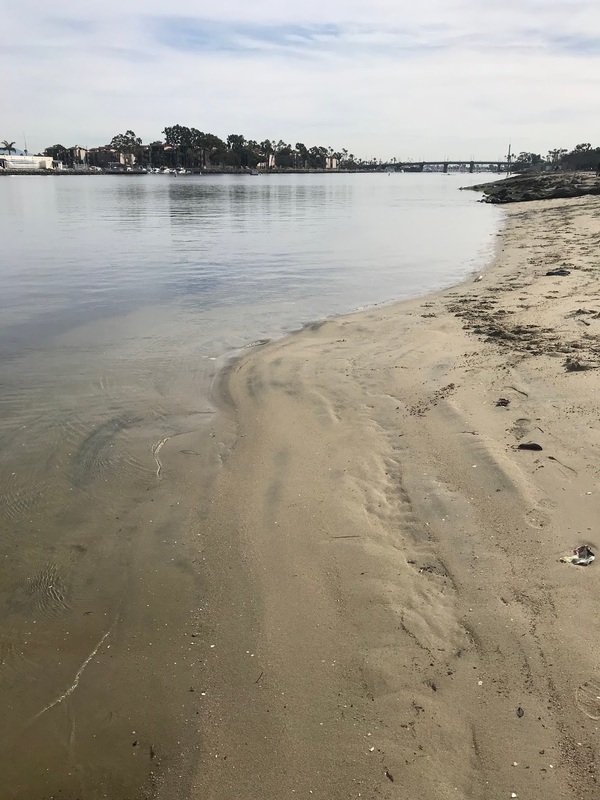 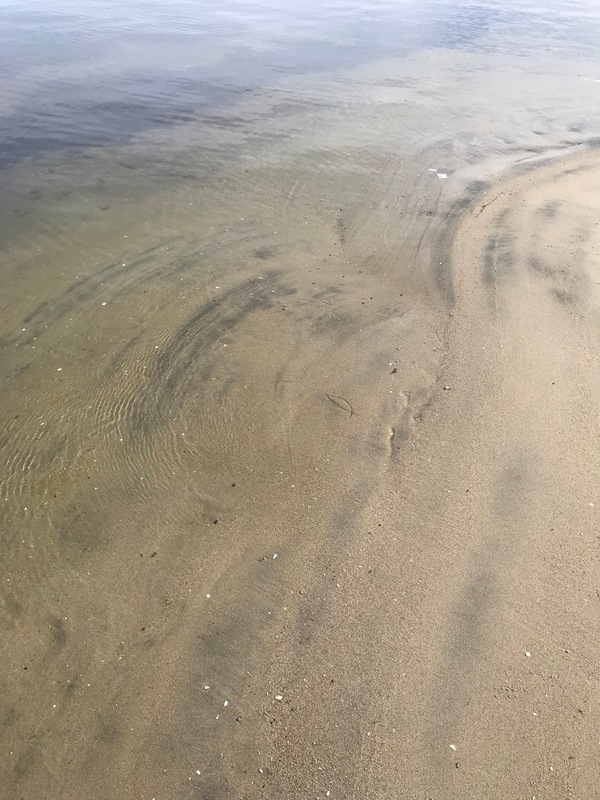 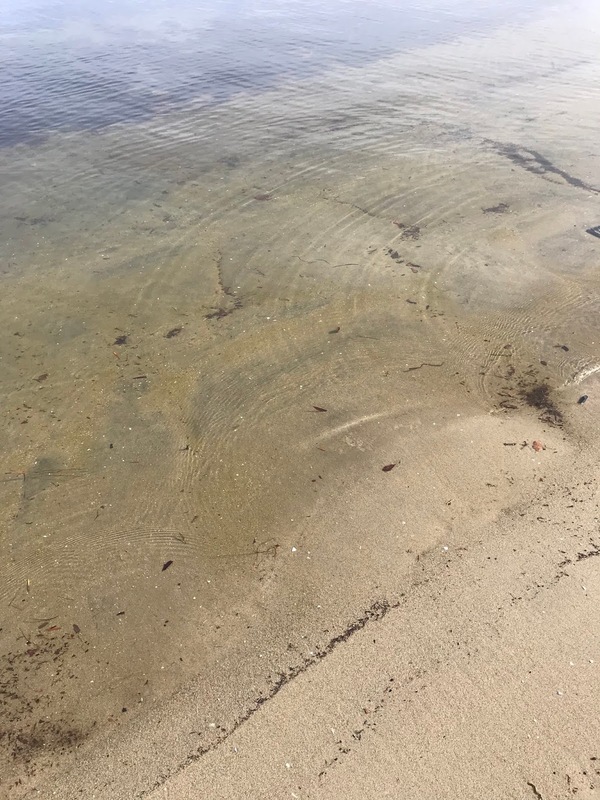 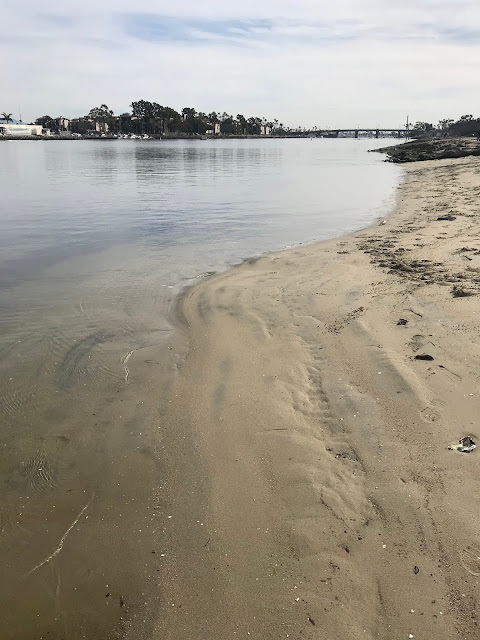 It was disgusting and the water was a wasteland due to a dry weather storm drain which allowed discharges into the Lagoon. Spurred by the Friends of Colorado Lagoon, the Coastal Conservancy funded a restoration feasibility study which was completed in 2004. 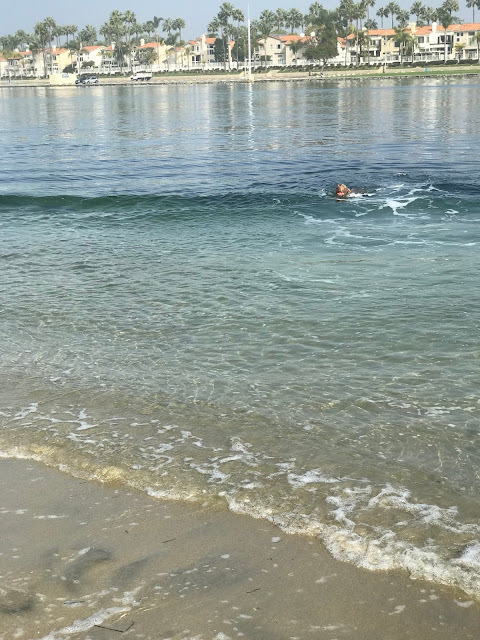 The restoration has been extensive and the 3rd phase was recently completed. 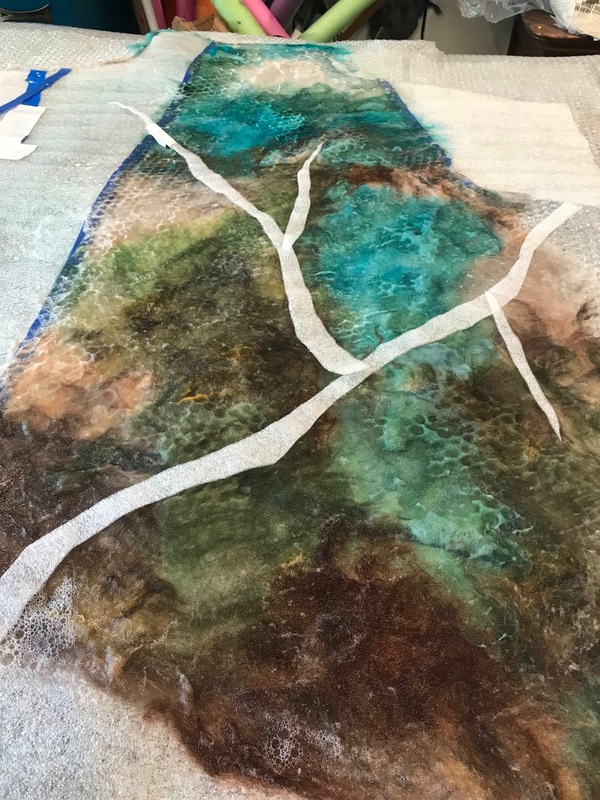 There are still more improvements to come. 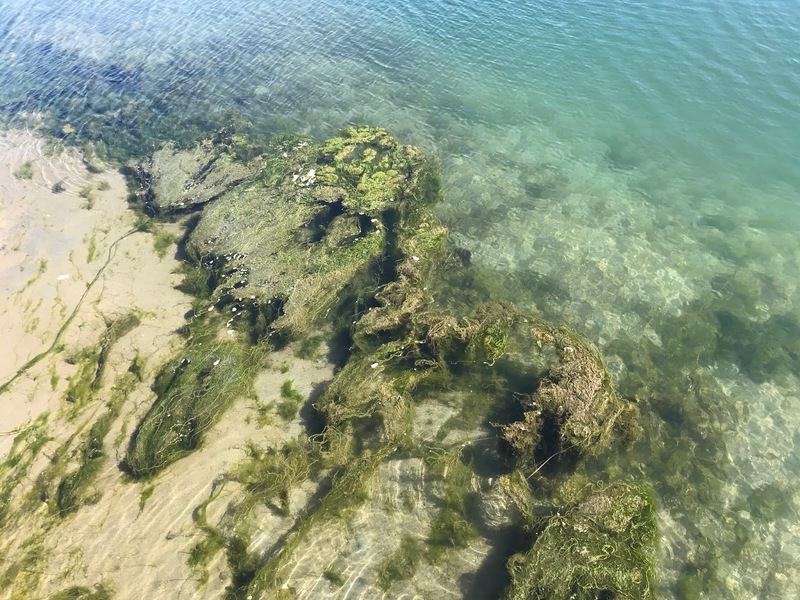 The metamorphosis of the Lagoon has been amazing to witness and what a joy to see the flora and fauna return and flourish. 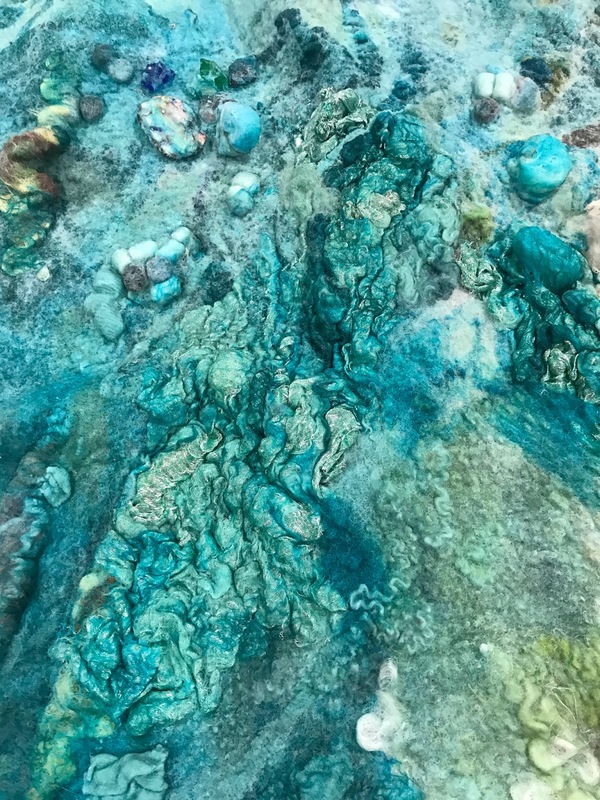 I was inspired by the Lagoon to create felted versions, both a vest and a wallhanging. 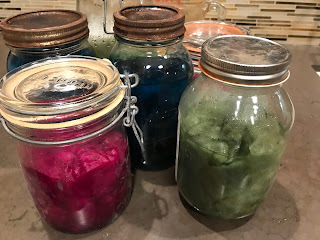 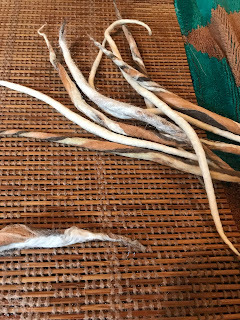 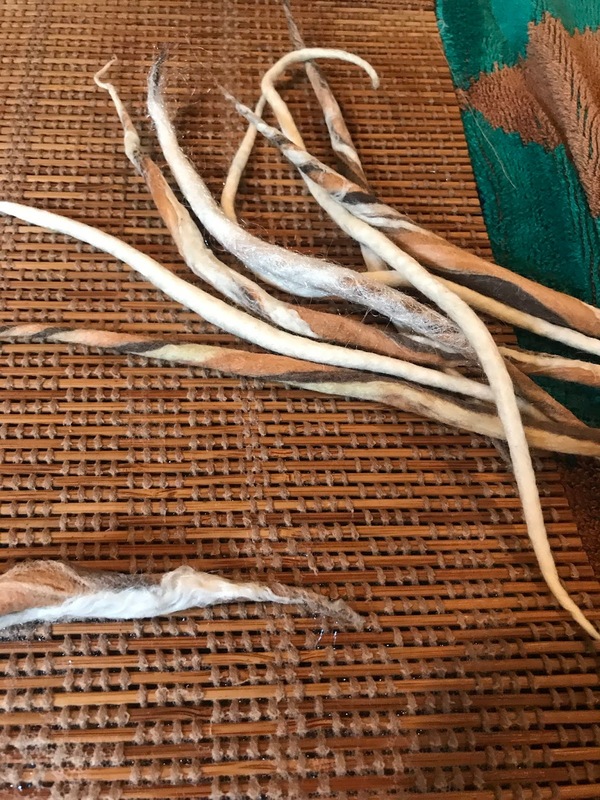 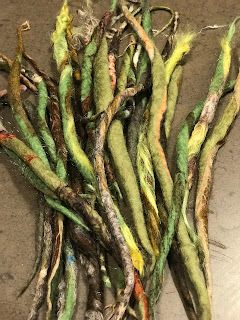 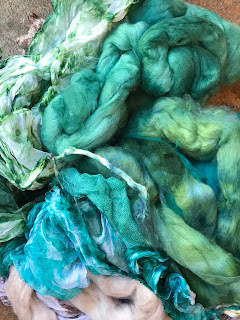 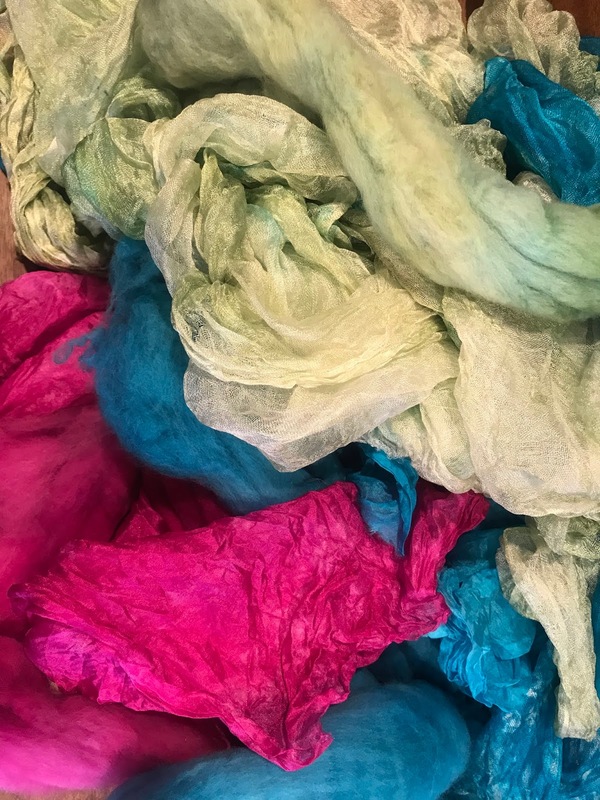 I dyed the majority of the wool roving and Margilan silk that I used in the projects. 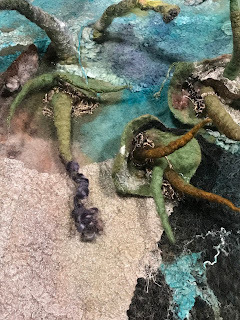 I made the cords and added them to the project during the prefelt stage. 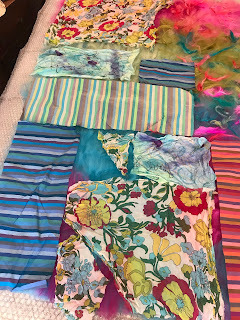 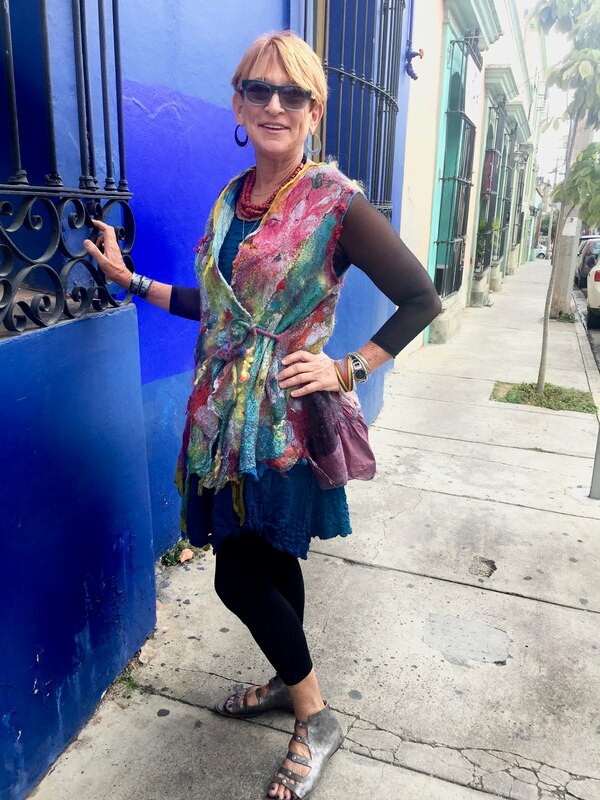 I used many other fibers and fabrics along with beach glass, cocoons and more. 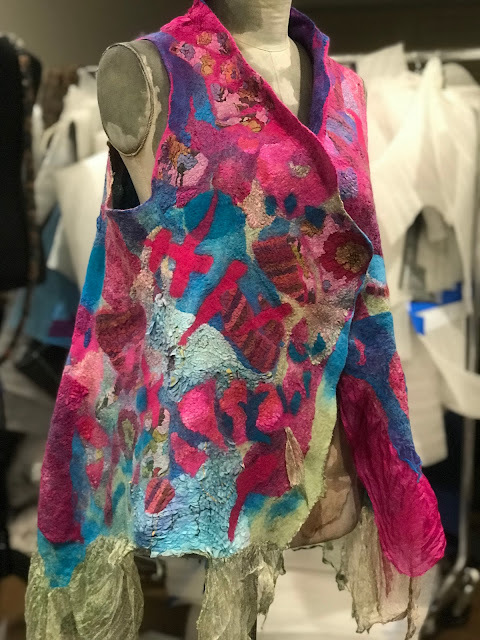 One side of the front of the vest. 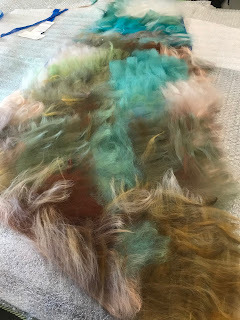 I laid out two layers of wool roving perpendicular to each other. 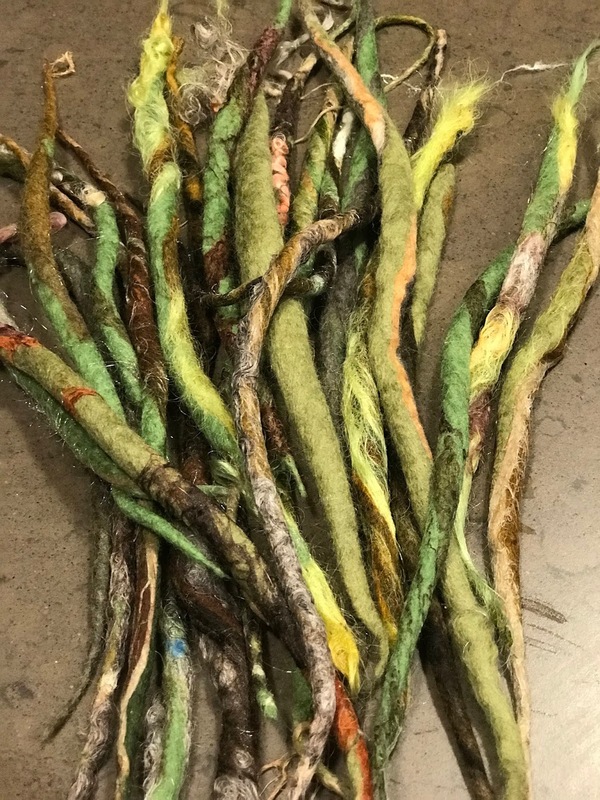 Cords are fun to make while watching TV. 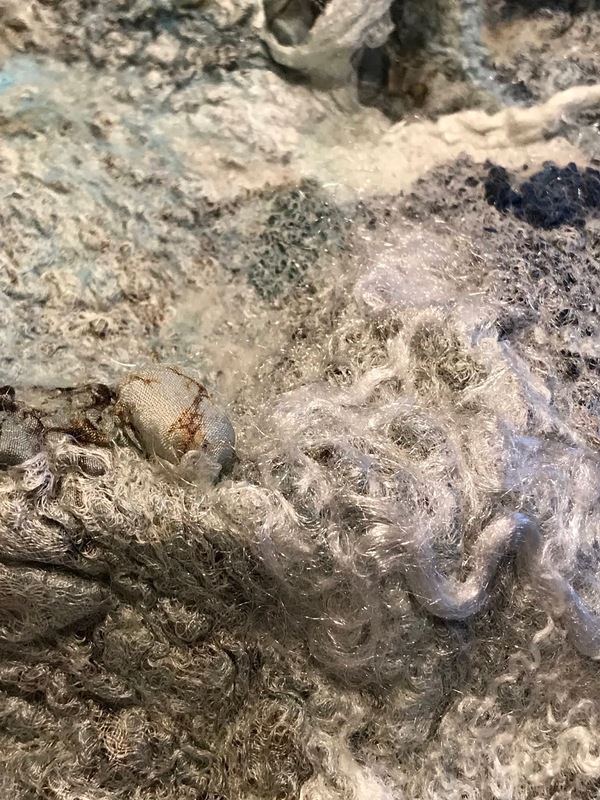 The white is plastic that I covered with roving and layer cut through the channel.